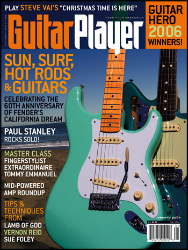 Get FREE Subscription to Guitar Player Magazine. All you need to do is fill out the form to request. Note: If it say’s “Session Expired” jusy click “OK” and that will bring up the form. GUITAR PLAYER is a magazine for serious guitarists who want to make the most out of their playing and keep informed on developments in equipment and instruments. Editorial emphasizes stylistic diversity in coverage of music and leading and up and coming guitarists. Features include instructional columns, how-to advice, honest equipment reviews, recording, song writing, record reviews and career information.